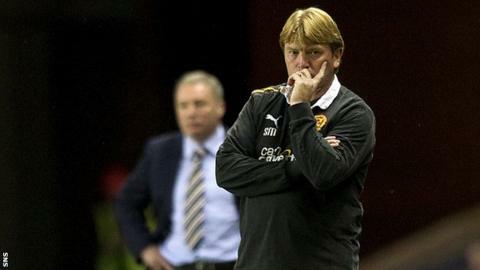 Stuart McCall has shrugged off suggestions that his Motherwell side lack effort against the Old Firm. The Scottish Premier League leaders lost to Rangers in the Scottish Communities League Cup on Wednesday and have won only one of 15 games against the Old Firm in his time as manager. "People who think that, don't know me," McCall said of suggestions that there is a problem against the Old Firm. Motherwell host third-placed Celtic at Fir Park on Saturday. And McCall's team will be looking to extend their lead at the top of the table. "It probably comes from the inexperience and naivety in defence if I'm honest," McCall said of the defeat by Rangers. "You look at the experienced players we've lost last season, in Tim Clancy, Stephen Craigan and Steve Jennings and I just feel recently that we're losing soft goals. "Maybe it's through a lack of organisation at times because there was nothing between the teams until the first goal. "We knew how important the first goal was going to be and, unfortunately, we lost it. "Even the second goal, Shiels scores and we've got six in the box; there's only one Rangers player in the box and he manages to score. "We've got to learn from it and the young lads are doing their best to do that. "I'm as disappointed as any fan, every player is as disappointed. Nobody's doing cartwheels when we're beaten; if people think that then they must be at a different game and they don't know me." The Motherwell boss admitted it was difficult to compete with the Old Firm because of the strength of their squads. "Against Rangers last season here [at Fir Park] we lost 2-1 to a last minute Lee McCulloch goal and then went there and drew 0-0," McCall said. "Last season Celtic came here and scored a late Gary Hooper goal to win 2-1 and we lost 1-0 at Parkhead with a defensive error from a long throw." McCall said his league leaders would face a stern test against a Celtic side that were hitting form at the right time. "They've got strength in depth and quality in abundance," he said. "Unless we're at our best then we won't take anything from the game. "We're not getting carried away that we're top of the league and we've pushed Celtic close."